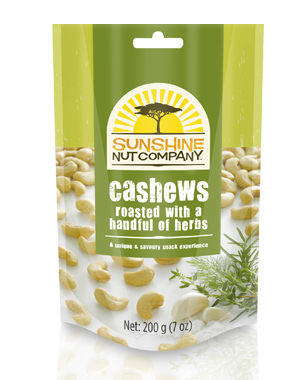 The Sunshine Nut Company is Mozambique-based, exporting locally produced cashews to South Africa and the States. With a strong social investment back into the communities that farm the cashews, a strong brand and packaging identity was needed that appealed retailers and consumers, as well as sharing their philosophy and do-good factor in a direct yet subtle way. The result is a pack that holds the product as hero and an brand that is striking as it is tasty.